BACKGROUND: Human cytomegalovirus (CMV) infection is related to biliary disease, being cholestatic in its own right. It has also been associated with intrahepatic bile duct destruction and duct paucity, indicating a possible role in the pathogenesis and progression of extrahepatic biliary atresia (BA). BA patients who are CMV-IgM-positive appear to have greater liver damage than uninfected patients, consequently affecting outcome. METHODS: We reviewed the medical records of 74 patients diagnosed with hepatobiliary disease between 2000 and 2011, assessing clinical outcome and potential risk factors. Patients, categorised into those with and those without BA, were compared in terms of CMV infection. RESULTS: The 74 patients included 39 (52%) BA and 35 non-BA patients; following the exclusion of patients due to insufficient data, 27 (69%) BA and 31 non-BA patients were reviewed. Twenty-one (78%) BA patients were CMV-positive (IgM/IgG), including 20 IgM-positive patients versus 8 in the non-BA group (p<0.01). Two (7.5%) CMV-IgM-positive BA infants were HIV-exposed versus 7 (35%) in the non-BA group (p<0.01). Long-term outcomes included 3 deaths in the non-HIV CMV-positive group and a higher rate of severe early liver damage, suggesting a poorer outcome in CMV-affected patients. CONCLUSIONS: Our results suggest a correlation between CMV exposure/infection and BA which affects clinical outcome. HIV-positivity does not preclude BA and should be investigated further. Biliary atresia (BA) is a neonatal cholestatic jaundice which results from obstruction of the extrahepatic biliary system due to destructive inflammation of unknown aetiology. It occurs in 1/5 - 1/8 000 live births in Asia and 1/18 - 1/20 000 children in Europe.1,2 Apart from this difference in incidence, no ethnic differences have been demonstrated. However, females appear to carry a slightly higher BA risk. BA affects variable lengths of the extrahepatic system and, if untreated, most patients die of biliary cirrhosis before their second birthday due to liver failure. Recognised subtypes include an embryonic form (BA splenic malformation (BASM)) associated with other congenital anomalies, as well as at least 3 other subtypes (isolated BA, a cystic variety, and cytomegalovirus (CMV)-IgM-positive BA). If treated timeously by surgical drainage (Kasai procedure), approximately 40 - 55% of affected children can clear their jaundice to normal values and expect at least a 5-year native liver survival.2 BA is the leading cause of end-stage liver disease in children, leading to significant mortality and morbidity;3 therefore, research into potential causes would improve results, and possibly prevention. The aetiology of BA is unknown, but it is generally agreed to be attributed to multifactorial prenatal and perinatal insults to the developing biliary tree. Research points towards a viral-initiating factor in predisposed individuals, which initiates an antigen-antibody reaction that causes inflammatory targeting of the extrahepatic (and possibly intrahepatic) bile ducts.4 This mechanism is of particular interest in patients with impaired immunity (e.g. HIV-infected). We aimed: (i) to detect CMV infection rates and baseline characteristics of infants with BA over 10 years (2001 - 2011); and (ii) to investigate the effect of perinatal CMV infection in BA and compare the outcomes of CMV-IgM-positive children with non-exposed children with cholestatic jaundice. We performed a retrospective review of hospital records of patients with cholestatic jaundice, referred to the Paediatric Surgical Unit of Tygerberg Hospital from 2001 to 2011 (Table 1). Data were anonymously collated and stored in a Microsoft Excel database. Patients were categorised into 2 groups: those with and those without BA (non-BA), and were compared in terms of CMV infection. CMV testing results were derived from laboratory results or patient records. Fisher's exact and/or chi-squared statistical tests for significance were performed where applicable. A p-value <0.05 was regarded as statistically significant. Ethical approval of the study was granted (S12/02/061) by the ethics review committee of Stellenbosch University. Research was conducted according to guidelines outlined in the Declaration of Helsinki. Patient anonymity and confidentiality were protected. Of the 74 patients investigated, 39 (52%) had BA and 35 had other causes of surgical hepatobiliary disease (Table 1); 27 (69%) BA patients and 31 (89%) non-BA patients were reviewed following the exclusion of 12 BA patients and 4 non-BA patients due to lack of sufficient data. Twenty-one (78%) BA patients had CMV positivity (IgM/IgG) on testing; 20 were IgM-positive, whereas 8 non-BA cholestatic jaundiced patients were IgM-positive (p<0.01). Two (7.5%) of 27 BA infants were HIV-exposed (born to HIV-positive mothers), whereas 7 (35%) of the non-BA group were HIV-positive (p<0.01). Both HIV-exposed BA infants were CMV-IgM-positive. Long-term outcomes of the 21 CMV-positive BA patients (non-HIV exposed) included 3 deaths and a higher rate of severe early liver damage, suggesting a poorer outcome in CMV-affected patients. 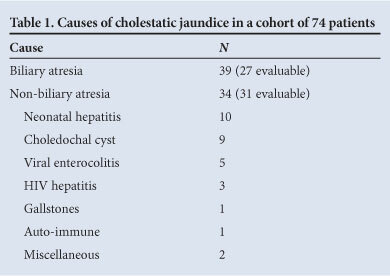 The surgical causes of prolonged neonatal jaundice include BA, hypoplasia of bile ducts, inspissated bile ducts, choledochal cysts and spontaneous bile duct perforation. BA remains the most common neonatal cholestatic disorder and is characterised histologically by complete obliteration of the lumen of all, or part, of the extrahepatic biliary tree. A principal difficulty in making the connection between these entities is that no single test is 100% sensitive and/or specific for CMV infection.1,9,13,16 Serology, CMV quantitative polymerase chain reaction (qPCR), immunohistochemistry and histology have been unable to confirm a possible role of CMV in BA aetiology. De Tomasso et al.9 describe a low accuracy of serological tests for detecting active CMV infection, with no correlation between the CMV-positive qPCR and histopathological changes reported by others.1,13,16 Our study, however, reinforces a probable correlation. The presence of co-morbidities such as HIV raises interesting possibilities in the antigen-antibody hypothesis of BA aetiology. This is of particular interest in areas of high HIV prevalence, such as sub-Saharan Africa, and is probably explained by the fact that some non-BA patients with neonatal hepatitis on biopsy were subsequently shown to be HIV-related. Our results, however, demonstrate that HIV exposure did not preclude the occurrence of BA in at least 2 cases. Recent evidence indicates that an interaction between HIV infection and other environmental factors such as CMV co-infection accelerates immune system deterioration.20 On the other hand, should an antigen-antibody be important in the aetiology of BA, impaired immunity, such as HIV, may influence BA type and/or outcome. As such, this connection warrants further study. Our results suggest a correlation between CMV exposure, infection and surgical hepatobiliary disease, including an effect on BA outcome. HIV positivity does not preclude BA; a relationship that requires further investigation.